Genetic mixture analysis is an important tool to apportion catch amongst potential component populations contributing to a fishery. 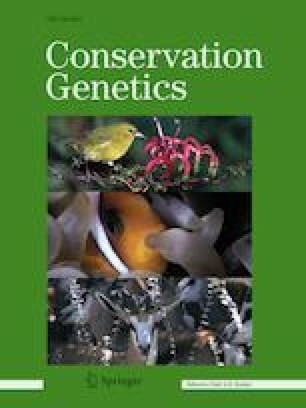 We used variation at 10 microsatellite DNA loci to assess the level of genetic divergence between two ecotypes of rainbow trout (Oncorhynchus mykiss) that naturally co-occur in Kootenay Lake, southeastern British Columbia, and to exploit such divergence in a mixture analysis. One form, “Gerrard” rainbow trout, historically matured at sizes greater than 60 cm and 5 kg, spawns at a lake outlet after upstream migration in a large river tributary to Kootenay Lake, and is highly prized in the recreational fishery. The other form, “non-Gerrard” rainbow trout, is also native to the lake and matures at smaller sizes and spawns in numerous small streams tributary to Kootenay Lake. Recent declines in growth rate of Gerrard rainbow trout, however, has made them difficult to identify by size in fishery samples. Gerrard (N = 130, 6 sites) and non-Gerrard trout N = 312, 15 sites) were highly divergent from one another (FST = 0.14, P < 0.001) and constituted distinct genetic groups in model-based clustering analyses. Genetic mixture analyses of fishery samples indicated a high degree of accuracy in estimating mixture proportions; 100% Gerrard simulated fisheries were estimated to contain 99.9% Gerrards (95% confidence intervals of 99.8–100%) while 100% non-Gerrard rainbow trout simulated fisheries were estimated to contain 100.0% non-Gerrard trout (100–100%). Across eight fishery creel samples obtained between 2015 and 2017 (N = 527 fish), mixture analysis estimated the fishery to contain an average of 73.4% (95% confidence interval = 68.4–74.6%) Gerrard and 26.6% (23.4–31.6%) non-Gerrard trout. Realistic fishery simulations demonstrated strong agreement with empirical results; the average simulated values for Gerrards was 73.4% (65.9–80.0%) and for non-Gerrards was 26.8% (20.0–34.1%). Assignment tests resulted in an average 98.5% (± 0.066%) assignment confidence; 385 fish from the fishery samples were assigned to the Gerrard group (0.73) and 142 (0.27) to the non-Gerrard rainbow trout genetic group. Fitting length-at-age data for genetically assigned fishery samples to a von Bertalanffy growth model found greatest support for a model employing ecotype-specific L∞ (= 59.6 and 52.9 cm for Gerrards and non-Gerrards, respectively, both P < 0.001), and t0 (= − 1.36 and − 2.58, respectively, both P < 0.05), but a common K (= 0.189, P < 0.001). Our mixture analyses are being used to monitor catches and better understand the feeding and migration biology of these sympatric ecotypes of rainbow trout. The online version of this article ( https://doi.org/10.1007/s10592-019-01182-4) contains supplementary material, which is available to authorized users. Fishery samples were provided under contract to Reel Adventures, Nelson, BC. Funding for this project was arranged by Sue Pollard of the Freshwater Fisheries Society of British Columbia. Lab work was supported by equipment purchased with Natural Sciences and Engineering Research Council of Canada (NSERC) Discovery and Equipment grants awarded to EBT. The laboratory assistance of K. Higgins is greatly appreciated as are the helpful comments of reviewers and JC Garza.